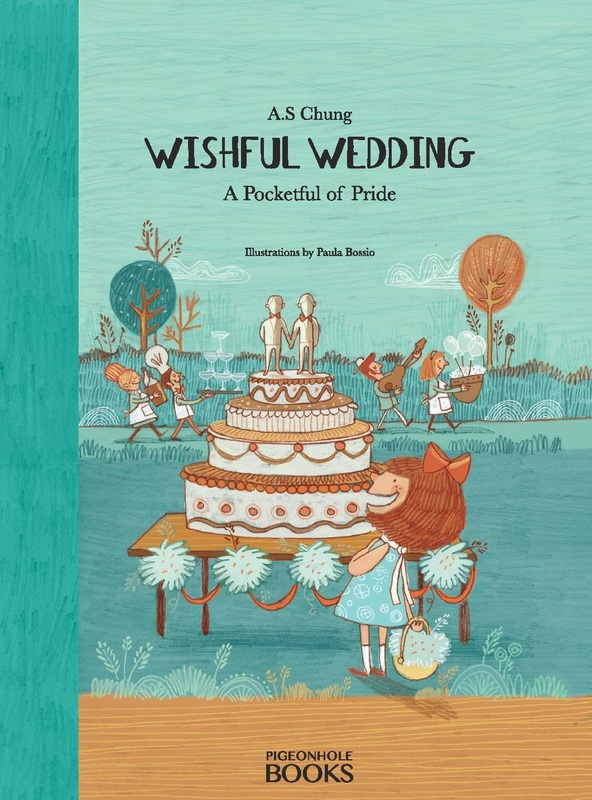 Pigeonhole Book is giving away 2 hard cover copies of Wishful Wedding: A Pocketful of Pride, an LGBTQ children’s picture book about same gender marriage equality. Should you reside in the US, click here for a chance to win a copy! Competition ends August 24, 2015 11:59 PM PDT. 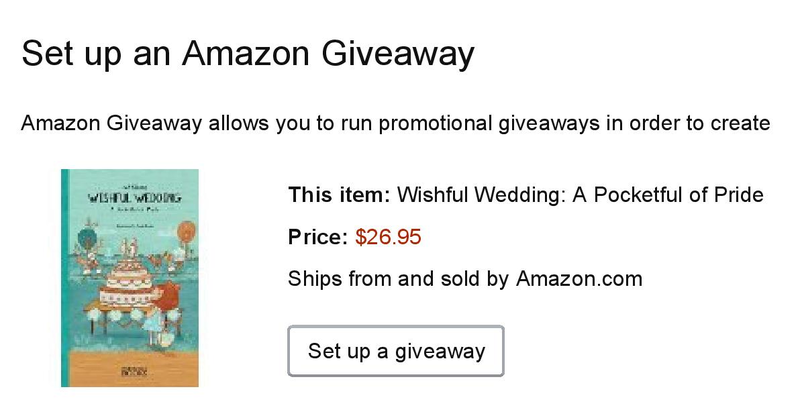 In February 2015, Amazon introduced Amazon Giveaway, giving indie authors yet another means of promoting their books. 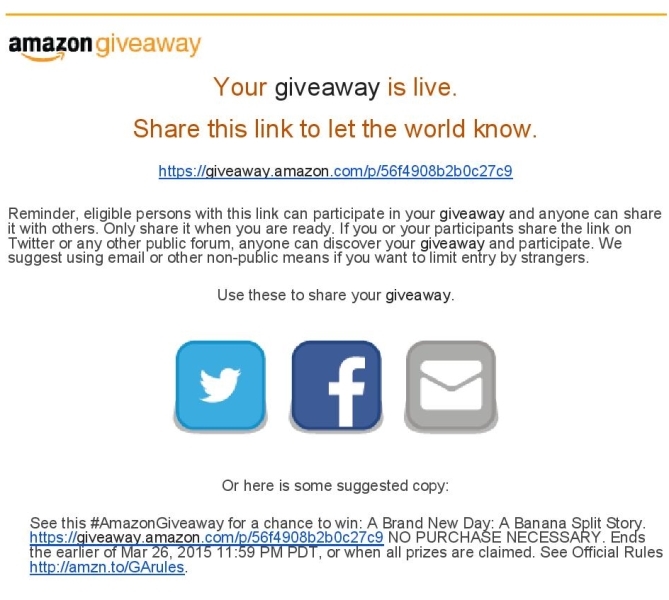 Amazon Giveaway is a self-service tool available via Amazon.com to host a giveaway of any product available on the website. Hence, it is a great opportunity to run a sweepstake on your self-published book that is available on Amazon. Currently, this tool is solely accessible for print editions of your book and is only applicable in the US. The giveaway is at the retail cost of your book on Amazon, including postage and handling. The actual set up and running of the giveaway is free. You will have to pre-pay the cost of your giveaway. Any unused giveaways when the competition concludes, you will be given a refund. The process is actually quite simply and only takes a couple of minutes of your time. “Lucky Number” option. 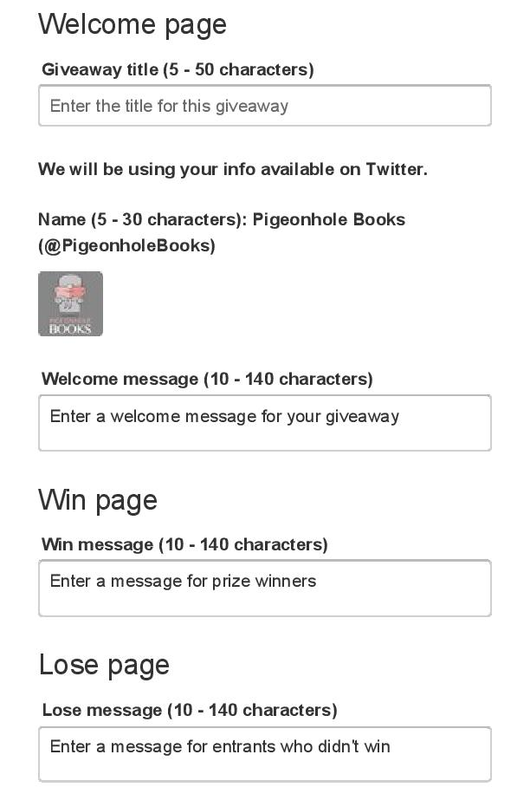 Example, every 100th person wins a book. This is perhaps the better option for authors as it enables the giveaway to last longer and also you are able to gain more followers. Don’t underestimate how many people will enter so stretch it out. I did every 75 entrants for 10 books and it only took a couple of days! “First Come, First Served” option. This creates a greater sense of urgency but it would mean your giveaway would end extremely quickly! This was the clincher for me when deciding if I should spend money on this giveaway. 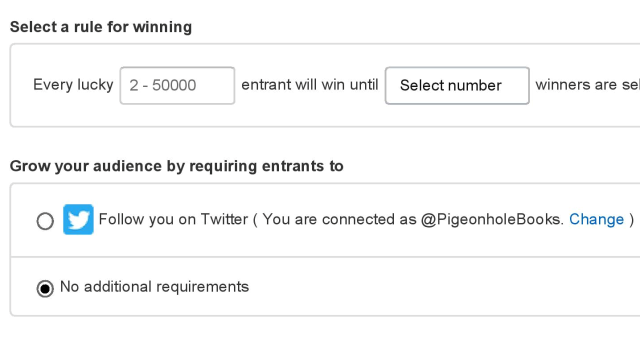 Every entrant must follow you on Twitter before they are permitted to enter the competition. My Twitter account made excellent headway and I gained a few hundred followers in a couple of days. Important to note however that followers DO NOT translate to an audience. It is merely a prerequisite for the entrants so expect at least a 25% drop off in the subsequent days. It did however increase my follower count and I don’t care what anyone says but it creates the perception of a valuable Twitter account. 1000 followers sure looks better than 56! Make sure your Amazon account has your right Twitter handle. Amazon Giveaway is Now Live! #AmazonGiveaway is all you need on Twitter. Check it out for yourself and see how many competitions are running at one single time! As you only have a short period of time, make sure you marketing it consistently to capitalise on the competition. Well, there you have it. This is a very simplistic look of what it is and how to use this tool. If you have entered an Amazon Giveaway, I would love to hear your experiences! I am sure it warrants further analysis and discussion but that’s a post for another time! DadsDivorce.com was founded by Joseph E. Cordell, of Cordell & Cordell, for the purpose of informing fathers about their rights during divorce litigation, while providing them with concrete, practical resources to achieve the best results in the courtroom. It is tailored for the needs of fathers as they know that the divorce process can be hard, especially for men. Dads.Divorce.com has kindly reviewed A Brand New Day and is also giving away a copy of our book! “When sharing custody of your son or daughter, it can be challenging for the child to maintain a sense of family while shuffling back and forth between parents during the week. 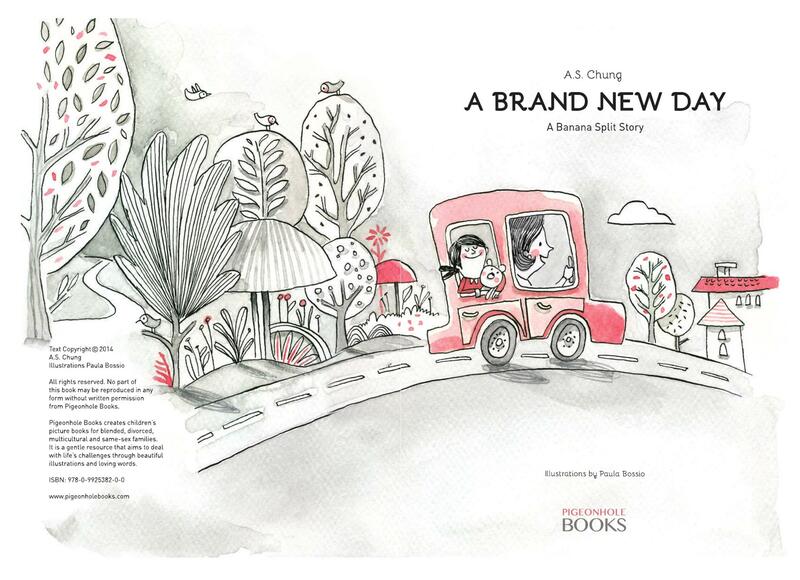 In “A Brand New Day – A Banana Split Story,” children’s author A.S. Chung shows that it’s possible to maintain a loving relationship with both parents even though they are divorced. With illustrations from Paula Bossio, Chung follows a young girl whose parents are divorced throughout a typical week. On one page, she’s gleefully planting flowers with her mother. On the next, she’s joyfully camping with her father. NOTE: DadsDivorce will hold a book giveaway for one copy of Chung’s “A Brand New Day ­­– A Banana Split Story.” To enter in the giveaway, either like, share or re-Tweet this post (NOT at Pigeonhole Books) on social media or email info@dadsdivorce.com by Friday, Nov. 21, at 12 p.m. Central Standard Time. The winner will be chosen randomly and announced the following day. Pigeonhole Books is giving away A Brand New Day on Goodreads! Offer ends 30th September 2014 when a lucky winner will be randomly drawn by Goodreads. Enter here.